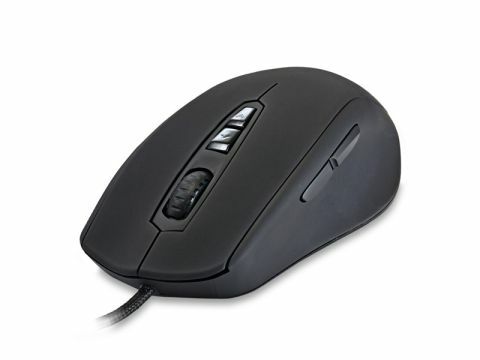 Can this cheaper gaming mouse from Mionix compare to the well specced Naos 5000? The first gaming rodent we saw come scuttling out of Mionix's Swedish workshop was the Naos 5000, and a lovely little thing it was too. It came with all the headline-grabbing numbers you could want from a gaming mouse, with lightning-fast DPI settings, huge polling rates and even a Surface Quality Analyser Tool (SQAT). It was a pricey £60 at launch, and that held it back somewhat from gaining the score its tech and design may have deserved. But now Mionix is back, with the slightly cheaper 3200 version. Thankfully, the Naos 3200 is using exactly the same ergonomic design as the 5000. Our chief crayon, Matt, has been using it exclusively since he first clapped hands on it. Indeed, he's even now calling it: "the most comfortable mouse I've ever used – even with my fat hands." High praise indeed. And it is damned comfortable, cradling all five fingers with its soothing rubber surface. Even on my slightly gritty desktop it slides like a dream, and on a decent mouse mat it feels like it's bordering on frictionless. This £40 version doesn't have quite the headline-grabbing numerals, but with a top DPI setting of 3,200 it isn't bad, and it still has the seven programmable buttons and macro functionality. It's lacking the SQAT, and more importantly, the added weight of the 5000, whih makes it far lighter and a little more flimsy. Retaining the most important base features of the 5000 means that the 3200 is still a worthy mouse. If you're not fussed about having a weighty mouse then this ergonomic beauty is well worth a look.